Clone the Time Capsule hard disk to another hard disk (drive-to-drive copy). I used a hardware duplicator for this step. You'll need the cloned drive later. 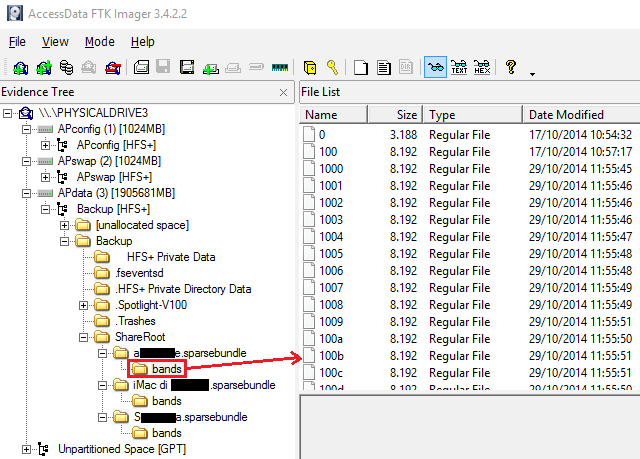 In my case the sparsebundle files were stored in "/volumes/Backup/ShareRoot". 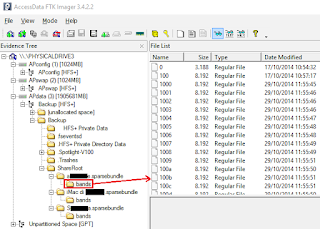 FTK Imager will just show a number of files of 8 MB in size. Connect the cloned drive in RW mode to your Mac and choose not to use it as a Time Machine drive. Connect to your Mac an additional drive of the same capacity as the Time Capsule drive. In case your Mac doesn't have enough USB/FW ports, you can copy (drag and drop) the sparsebundle files to the internal drive on your Mac. Once finished with dcfldd, unplug the destination drive. As a final step, capture a compressed forensic image of the destination drive. A compressed E01 image will be more or less the same size as the relative sparsebundle file. You have to repeat all the steps for each sparsebundle file. If you know a quicker way, please let me know.